Heat gas or charcoal grill, or grill pan. 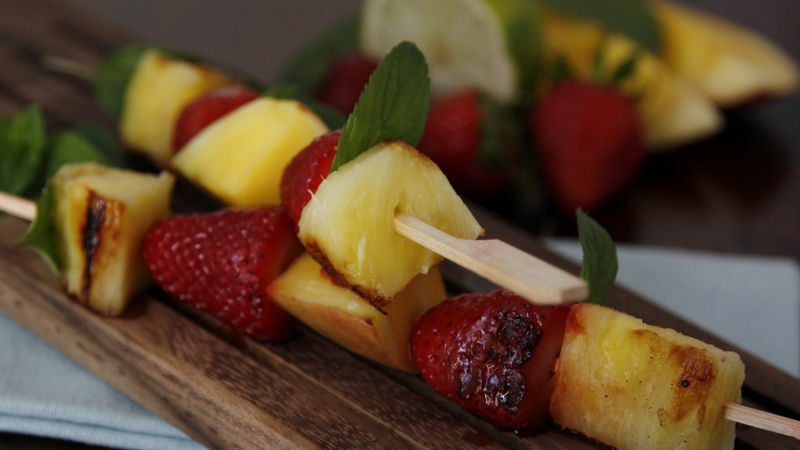 Onto each wooden skewer, thread pineapple, strawberry, mango, strawberry and pineapple. Lightly sprinkle with salt and pepper. Squeeze lime juice over fruit. Place on grill over medium heat. Cook 2 to 4 minutes, turning every 30 seconds, until fruit softens and grill marks appear. Recipe can be easily doubled or tripled. If desired, add mint leaves prior to serving and a drizzle of honey.